There's a certain je ne sais quoi to the natural glow of flushed cheeks and rosy lips. Of course, not all of us are blessed with a perpetual glow and just-bitten pout. But the good news is that the makeup industry has done its best to give us what nature should have through the ingenious invention of lip and cheek stains. That said, while some of these products have forever earned a place in our readers' makeup bags, others have wound up in the trash. Check out this list of best and worst lip and cheek stains now. Pick a shade that complements your skin tone. Keep in mind that cheek stains look darker in the bottle than on your skin. Test before you buy, or purchase at a drugstore that will accept returns after use. Wash your face with an exfoliating cleanser. This will slough off dead skin and help even out your skin tone. Then, apply a light moisturizer all over your face and neck. If you use liquid foundation, blend it into your skin before cheek stain application. If you're more of a powder girl, apply after your cheek color. Use your fingertips or a beauty blender and smile as you blend the color onto the apples of your cheeks. If you're using a liquid stain, make sure to blend quickly (and wash hands right after unless you're using a sponge). 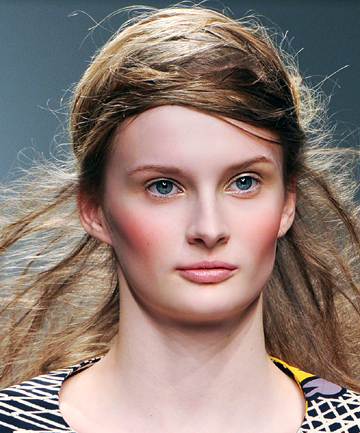 If you end up looking clownish, rub a dab of foundation onto your cheeks to dilute the color. If you need more color payoff, layer on the product until you reach your desired hue. As for your lips, check out this miracle skin care trick for dry lips video to get the most of your lip stain. And now, discover this list of the best and worst lip and cheek stains. Now i know not to get revlon just bitten or covergirl outlast! i actually was planning on buying the covergirl one. good thing i didnt. Does anyone know if the new sally hansen colorfast lip balm works?? Totally agree with the Revlon stain being the worst! Glad I'm not alone! i wanna try lip stains. Several popular products mentioned and described well; what was missing was Tarte's spectacular "LipSurgence" tint which truly hydrates as welll as colors. Oh, and I'm scratching my head over the Laura Mercier review. True, it's not really a stain, but it's lovely, and it doesn't cause me any pain. Not sure what those comments were about. After using Benetint for about a month, I had chronic dry lips. It took forever for the dryness to go away. I won't use it again. I use Body Shop's stain. I have one in my desk at work, my purse, gym bag and in my bathroom. Can't live without it. Sad it wasn't rated here, but I'm excited to try some of the others. I love stains over lipstick.